I have owned this spoon for a very long time, but have just recently completed my research on this very historic spoon. The spoon is a modified sterling Towle Silversmiths Newport pattern (ca. 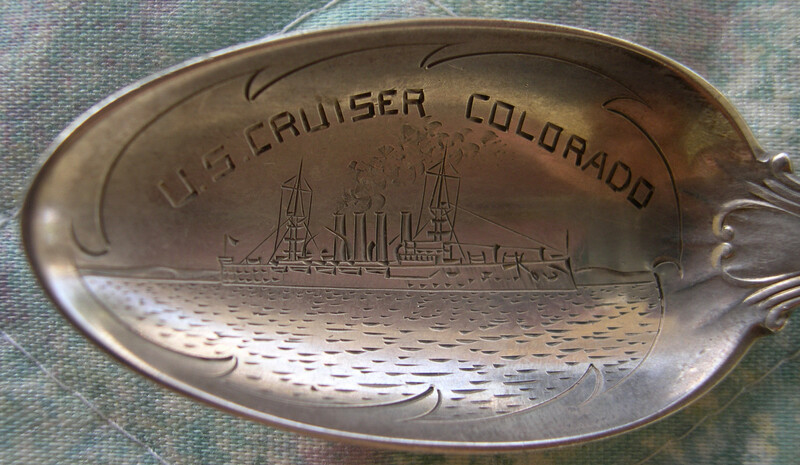 1900) tea sized spoon with an engraved picture of the U.S. Cruiser Colorado in the bowl and the shield of Colorado near the top. 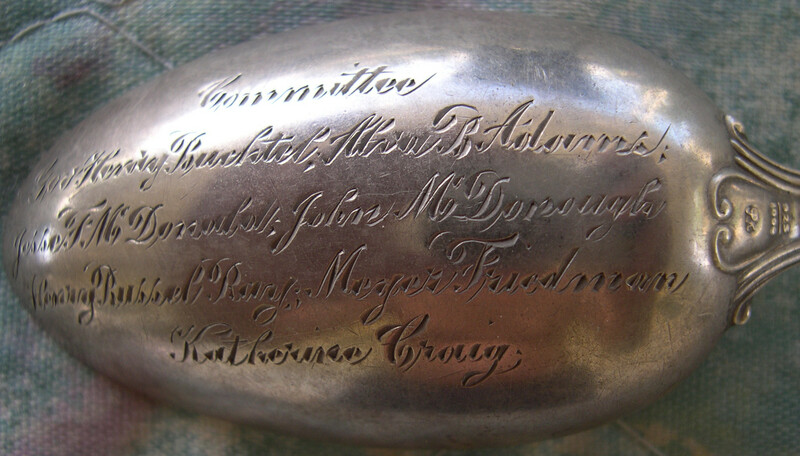 However, on the back of the bowl is engraved the word "committee" along with the script names of seven individuals. 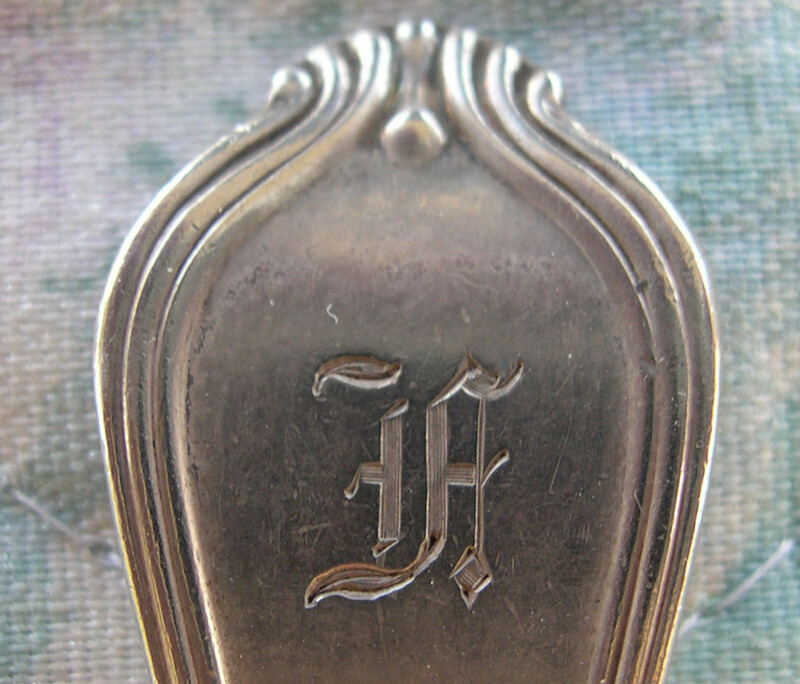 On the back of the handle is a letter engraved in the 'old english' style and there is a small engraver mark of "pr" below the typical Towle quality standard mark. I suspect that they used this pattern because Newport, Rhode Island is a major ship building facility. My primary interest in this spoon is the engraving on the back, but first some preliminary information of the ship. The information on on the Cruiser Colorado comes from the DEPARTMENT OF THE NAVY -- NAVAL HISTORICAL CENTER along with this photo. "USS Colorado, a 13,680 ton Pennsylvania class armored cruiser built at Philadelphia, Pennsylvania, was placed in commission in mid-January 1905. After service in the Atlantic and Caribbean areas, the ship deployed to the Far East in September 1906. A year later she returned to the U.S. to begin duty with the Pacific Fleet, which operated along the west coasts of the Americas and in Hawaiian waters. Colorado returned to Asia between September 1909 and February 1910, and again from November 1911 to July 1912." In 1916 the name was changed to the U.S. Pueblo so that the state name could be used on a battleship which was to be built and then she was involved in various WW1 activities. The ship was scrapped in 1930. I suspect that this spoon was created ca. 1905 and might be related to any launching ceremonies which were held. I could not find any information about a formal launching ceremony in my research. The word "committee" followed by seven names is engraved on the back. This is an incredible amount of engraving on the curved back of a spoon bowl. I am not exactly sure what was the purpose of the committee, but I suspect that it was to handle the relationship between the State of Colorado and the U.S. Navy, the Congress and other branches of the U.S. Government. The following names were engraved on the back of the spoon. 1. Gov. Henry Buchtel.-- Dr. Buchtel was the Republican Governor of Colorado from 1907-1909. He was Chancellor of Denver University before and after serving as Governor. 2. Alva B. Adams--. Gov. 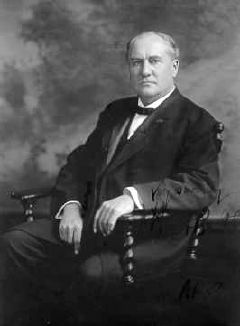 Adams was the Governor of Colorado for three terms( 1887, 1897 -includes a ten year hiatus) and the U.S. 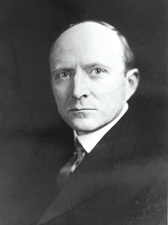 Senator from the State of Colorado (from 1923 until 1924 and again from 1933 to 1941). He was born in a 'log cabin', educated as a lawyer and was the leading Democrat in the state for most of his career. 3. Jesse F. McDonald --. Mr. Mcdonald began his career as an mining engineer in Leadville, Col. He became mayor of Leadville and then he became governor of Colorado(1905-1907). 4.John M'Donough -- John McDonough was a wealthy real estate developer but not much is known about him. He lived in a spacious home at West 46th Avenue and Perry, in Harkness Heights, a development of his own making. 5. Henry Russel Ray. Despite considerable research, the only reference I was able to find to this man was a Henry Russel who was a prospector. 6. Meyer Friedman was a prominent citizen in Denver. I have done considerable research but have only discover a glimpse of his life. He appears to have been involved with the German American Trust Co. which was a leading banking institution in Denver dedicated to building low cost homes and they also invested in mining operations. He was the treasurer for "Denver Sheltering House for Jewish Children" (1909). He was the Chair of the Denver Metro Chamber of Commerce 1903-1904. He was also an executive trustee of the National Jewish Hospital for Consumptives in 1905 along with Simon Guggenheim who eventually went on to fund the famous John Simon Guggenheim Memorial Foundation in 1925. I also found a reference wherein he let a theatre production company use his barn for a play. 7. Katherine Craig -- Katherine L. Craig grew up in the area and became Jefferson County Public School Superintendent and was elected three times to the position of State Superintendent of Public Instruction from 1905-1930. . She specifically donated the 56 acre tract to Denver Mountain Parks "for the education of youth." She wrote Craigs Brief History of Colorado "for Teachers and Students" in 1923. The Katherine Craig Park is named after her. On the back of the spoon is an engraved letter in old english. 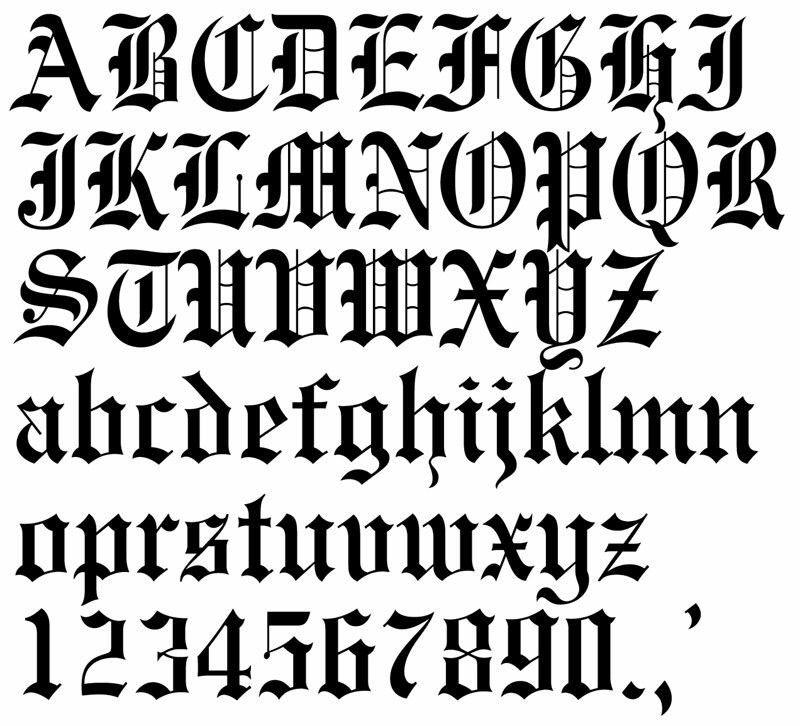 I was not able to decipher it until I downloaded the old english chart. Apparently it is an "F". Based upon this, I am guessing that this spoon was originally given to Meyer Friedman for his work on the committee. I am also speculating that seven of these spoons were made. Where are the other six?